The 12th Cyprus Wine Competition! WineScribble attends the press conference and meets the members of the wine tasting committee and the President of the Vine & Wine Association. Also, stay tuned to find out what was in the envelope she found in the post box after she gets home. Hey Tasters! We’re at the Panos Solomonides Cultural Centre in Limassol Today is the official launch of the various wine events that will take place within the frame of the 12th Cyprus Wine Competition. This is like the Olympics but for Cypriot wine! The competition is under the auspices of the International Organisation for Vine and Wine and His Excellency the Minister of Agriculture, Mr Costas Kadis. So many organisations have helped co-organise this event. The winners of the competition will be announced during an official dinner at the Royal Hall in Nicosia this Saturday. So stay tuned! But for now, let’s go inside. I’m here with Dr. Regina Vanderlinden. She’s an incredible woman! One of the most successful women in the world of wine. She has a doctorate in biological sciences. In enology, from the University of Bordeaux. And you’re a professor? Yes, and I am the O.I.V. President, the current O.I.V. president. And you’re here for the 12th Competition Of Cyprus Wine. Yes. I am here as an O.I.V. observer of the 12th Wine Competition, Cyprus Wine Competition. The competition of wine is very important to show to the consumers, to teach the consumers about the wine qualities. And it’s a good opportunity to the producer to show the wine qualities and it’s a good way too, for the marketing of the wine. Thank you very much. My name is Wolfgang, is the first name and Beiss is the family name. And I’m a born German, and I’m living since 40 years in Switzerland. And I’m participating, now is the seventh time, in the Cyprus Wine Competition. An international man, a wine lover. Yes! Wine lover, wine ambassador and as well a wine consultant, in the sense of bringing the the goodies to the world where people love to have a good wine, in a good company, with a good menu, with a good situation. Then, Cyprus wines is good too – yeah, I love it! You’ve seen the quality of Cyprus wine has gone up. Yes Cyprus wines about seven, eight, ten years ago was good. But it was a basis for something which developed extremely well and within the last five years I must say the increase of quality plus the wildness, the brightness and as well the the, the quality in each individual product has so increased that I can say that this is now totally well prepared for the world competition. It is true. I really feel it. You’ve heard it from a world authority guys. Thank you very much! You’re welcome. What can you tell me about the 12th Cyprus Wine Competition? It will be a difficult competition, I think. Because of the wines in Cyprus the last few years are getting better and better. So, we hope that those wines, they will make it difficult for us to choose the best of them. You hope it will be difficult? Tasters! I have here with me, Dr. Thoukis Georgiou from the Department of Agriculture. He is instrumental in the organisation of this competition. What can you tell me about what’s started today in this competition? Today we had just finished the press conference where the Minister of Agriculture announced… he did the political statement, supported by the mayor of the City of Limassol, the Wine City of Limassol, the Wine Capital of Cyprus. In the presence of the president of O.I.V., which is the International Organization for Vine and Wine. We are glad to start the competition today, in a four day session So at the end of the week, we will be happy to announce the best of the best! This is our job. Thank you very much! Hey guys, look at this! This is my official invite to the award ceremony at the Royal Hall this Saturday. I will find out who won the competition, first hand! I can’t wait! Now tasters I am NOT going to take all my camera gear to an award ceremony and an official dinner. However, I will take my phone and I will make sure I keep you up-to-date on my Instagram stories So stay tuned! You can find out all of the Award Winners as they happen, on Saturday. Guys, I have had a great day today! If you’ve enjoyed this video leave me a thumbs up. 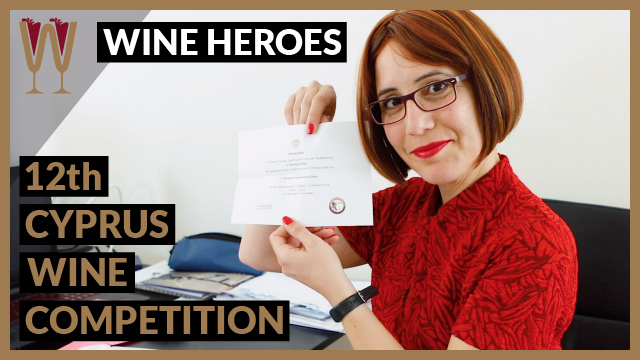 If you love Cyprus wine and if you are a fan of the Cyprus Wine Competition, please leave a comment below. Make sure you subscribe by hitting the red button, and I will see you on the next video! Cheers everybody!